Los Angeles Lakers owner Dr. Jerry Buss (he has a Ph.D. in chemistry) is a great hold-’em player. Buss has been sparring with the best hold-’em players in the world since 1987, and he has managed to stay ahead of the game. Buss has also managed to spar with all the owners and GMs in pro basketball. Buss has been a genius both at playing hold ’em and at dealing with the rest of the NBA. He and Jerry West dealt themselves into Magic Johnson, James Worthy, Shaquille O’Neal, Kobe Bryant and many other stars. These great deals led to eight championships! Of course, Buss has owned the Lakers since 1979. He owned them when they won five titles with Magic, Kareem Abdul-Jabbar and the rest of the “Showtime Lakers.” He owned them when they had Shaq and Kobe, and they won three more titles; and he still owns them today. In the next television confrontation that I watched, Buss played Layne Flack heads up for a World Poker Tour title at the Commerce Club in Los Angeles at the WPT Celebrity Invitational Tournament. Buss was unlucky to have to face champions Negreanu and Flack for titles when it could just as easily have been two lesser players. When Negreanu showed the A-Q, Buss said, “Ouch, that’s the one hand that I thought you might have that beats me!” Buss may have lost this pot. Buss may have lost to Negreanu in the NBC Heads-Up. Buss may have lost to Flack in the WPT Championship at the Commerce. 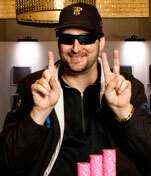 But Buss will continue to come at the top hold-’em players in the world, and he will grab his share of victories. That’s because Buss is a champion, just like his precious Los Angeles Lakers. A) It is tough to fold. B) It will win a lot of money for you. C) It will lose a lot of money for you.